Emerald Downs 2019 Season Plus New Tracks to New Mexico? 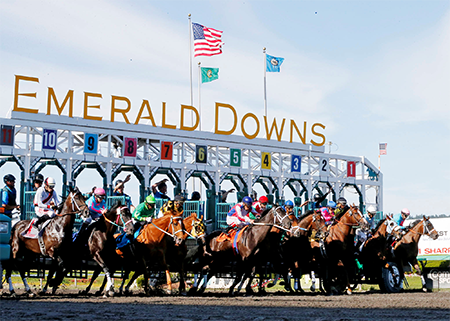 Washington State horse racing fans can now start planning their spring and summer activities, as Emerald Downs has announced their 2019 67-day live racing schedule. The Washington Horse Racing Commission approved the dates at their monthly meeting. They are nearly the same as last year's meet. Opening day will be April 20th followed by April 27-28th, as well as May 4th and 5th. Friday racing starts May 10th and will continue for the next 20 weeks of the season through September 22nd. Post times will remain the same with 2pm on Sunday, 6:30pm on Fridays and either 2 or 5pm on Saturdays. The first eight Saturdays will start at 2 while the last 15 Saturdays will have a 5pm post time. Emerald Downs will hold their annual Fireworks Spectacular on Wednesday, July 3. Racing will begin at 5 that evening. The complete stakes schedule will be released in January, but the 84th Longacres Mile (G3) will run Sunday, August 11th. One Racino License Remains: Will New Mexico Be Opening a New Track? Five companies have submitted proposals to build a new racino in New Mexico. The New Mexico Racing Commission has one license available and five bidders hoping to receive it. While the Commission has no obligation to give the license to any company, they will be making a decision later this week. Three of the five companies are hoping to build a track in Clovis, New Mexico, which sits just 17 miles from the Texas border. Another company has submitted a bid for the Tucumcari area, which is also just 40 miles from the Texas Panhandle. Both locations would draw crowds from Texas and offer closer gambling opportunities than what is currently available in those areas. The final company is looking at the opposite side of the state, hoping to build near Tucson, Arizona. Either company would be allowed 750 slot machines. One company is even looking at building a moving grandstand while another is offering a rodeo facility and hotel.